Ashburton is a charming little town, with an interesting mix of Elizabethan, Georgian and Victorian buildings. 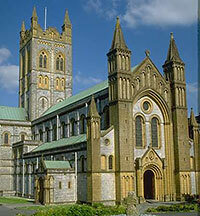 In medieval times it was a stannary town, where tin from the Dartmoor mines was brought for weighing and assessing. The ruins of several mines still exist nearby. The main streets, around the town centre, are delight to walk along. Lined with an interesting mishmash of 17th / 18th-c tile-hung and gabled buildings that jostle with the straight parapets of later houses, particularly around St Andrew's Church. In North Street, a shop with a Norman granite arch was once the Mermaid Inn, where the Parliamentarian general, Sir Thomas Fairfax, held his headquarters in 1646. The Old Grammar School was housed in St Lawrence's Chapel until 1938. The chapel tower is all that remains of the original 14th-c building. The rest of the structure dates from about 1593. A 14th-c door removed from the building is in the Ashburton Museum. On the Old Tomes Road, an ancient granite cross in a grassy plot stands beside a tiny spring. This is St Gudula's Well, the water from which was believed to benefit the eyes. The parish church of St Andrew's dates from the 15th-c, built in granite and Devonshire limestone. Its impressive tower rises to 92 ft (28 metres). The interior of the church has many notable features, including an ornate Victorian Gothic chancel screen. The west window is thought to be by E. Kempe (1837-1907). Under the tower is an oak chest made in 1482 with a lock that is still operated by the original key. 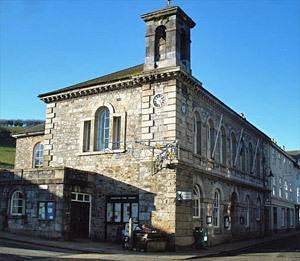 The town stands within the bounds of Dartmoor National Park, on the north-eastern edge of the rugged moorland plateau, making it an ideal centre for the exploration of the moor. Located in a traditional Devonshire weather-boarded house that was once a brush factory. Displays include a large and varied collection of North American Indian artifacts plus many other items of local historical interest. Located 3 miles west of Ashburton, Holne village was the birthplace of Charles Kingsley (1819-75), author of The Water Babies.